What Kind of a Weird Miracle is This Supposed to Be? That's what I asked myself when I first saw this video. It shows the River Jordan reversing the direction of its flow when it is blessed during a Theophany service. First you see it flowing to the left, then at the end, you see wooden crosses floating toward the right. Apparently, this happens every year at Theophany. Cool to look at, but so what? One rather wishes, if there is to be a miracle, that it would have some sort of meaning, not just a strange effect. So I decided to research it, and found out it is full of deep and multilayered meaning. I will try to condense it into as short a space as I can. Theophany? you ask. Theophany? I never heard of Theophany. It's what you may know as Epiphany, a feast that comes directly after the Twelve Days of Christmas, which is to say, the 6th of January. In the West, this feast is mainly about the Magi arriving to worship the infant Christ, but in Orthodox Christianity, the emphasis is upon Jesus' baptism in the River Jordan. The Feast has two main themes. The first is that this is the occasion when the Holy Trinity was first clearly revealed, when the Holy Spirt descended like a dove and the voice of the Father was heard saying, "This is My beloved Son, in whom I am well pleased." The second theme is water, because we don't believe Jesus was purified but the reverse. He sanctified the waters of the Jordan, and with them, all the waters of the world. But the water flowing backwards, what's with that? Well, it all begins with creation, but we can skip ahead to Moses, about 3500 years ago. You probably know the story, from Exodus 14, of how Moses led the Israelite slaves out of captivity in Egypt, and how the king of Egypt pursued him with his army and his chariots. It's an exciting story, a must-read. Anyway, when the situation looked most dire, "Moses stretched out his hand over the sea, and all that night the LORD drove the sea back with a strong east wind and turned it into dry land. The waters were divided..." The Children of Israel passed through the sea on dry land, the water forming walls on either side of them. Those walls, of course, collapsed when the Egyptian army came in pursuit, drowning them all. But the point here is, the waters were driven back. 1 Moreover, brethren, I do not want you to be unaware that all our fathers were under the cloud, all passed through the sea, 2 all were baptized into Moses in the cloud and in the sea, 3 all ate the same spiritual food, 4 and all drank the same spiritual drink. For they drank of that spiritual Rock that followed them, and that Rock was Christ. 14 So it was, when the people set out from their camp to cross over the Jordan, with the priests bearing the ark of the covenant before the people, 15 and as those who bore the ark came to the Jordan, and the feet of the priests who bore the ark dipped in the edge of the water (for the Jordan overflows all its banks during the whole time of harvest), 16 that the waters which came down from upstream stood still, and rose in a heap very far away at Adam, the city that is beside Zaretan. So the waters that went down into the Sea of the Arabah, the Salt Sea, failed, and were cut off; and the people crossed over opposite Jericho. 17 Then the priests who bore the ark of the covenant of the LORD stood firm on dry ground in the midst of the Jordan; and all Israel crossed over on dry ground, until all the people had crossed completely over the Jordan. 11 Then it happened, as they continued on and talked, that suddenly a chariot of fire appeared with horses of fire, and separated the two of them; and Elijah went up by a whirlwind into heaven. 12 And Elisha saw it, and he cried out, “My father, my father, the chariot of Israel and its horsemen!” So he saw him no more. And he took hold of his own clothes and tore them into two pieces. 13 He also took up the mantle of Elijah that had fallen from him, and went back and stood by the bank of the Jordan. 14 Then he took the mantle of Elijah that had fallen from him, and struck the water, and said, “Where is the LORD God of Elijah?” And when he also had struck the water, it was divided this way and that; and Elisha crossed over. 15 Now when the sons of the prophets who were from Jericho saw him, they said, “The spirit of Elijah rests on Elisha.” And they came to meet him, and bowed to the ground before him. 20 And he said, “Bring me a new bowl, and put salt in it.” So they brought it to him. 21 Then he went out to the source of the water, and cast in the salt there, and said, “Thus says the LORD: ‘I have healed this water; from it there shall be no more death or barrenness.’ ” 22 So the water remains healed to this day, according to the word of Elisha which he spoke. ​​The little hills like lambs. 5 ​​What ails you, O sea, that you fled? ​​O Jordan, that you turned back? 6 ​​O mountains, that you skipped like rams? ​​O little hills, like lambs? ​​The flint into a fountain of waters. On this day the River Jordan changes its course, and starts flowing backwards, underlying exactly this concept. The river Jordan, with its two traditional streams Jor and Dan represents also our lives, lives that flow from the first parents, Adam and Eve. From them the life of mankind started flowing toward the Dead Sea of sin and perdition, as Jordan River does. But when the Master entered the river, the Jordan started flowing backwards, in the same way as our lives turn toward our true godly origins when Christ enters into our lives. The events on the banks of Jordan uncovers the deep meanings of the Sacrament of Baptism in Christian practice. The mystical presence of Christ is present at our baptism. When we enter into the baptismal font Christ is also there with us turning around the course of our lives from a life spent in sin and worldly things into a life in virtue, and heavenly glory. As Gregory of Nazianzen says, “Christ is illumined, let us shine forth with Him. Christ is baptized, let us descend with Him that we may also ascend with Him.” God reveals His Son in the silence of our soul. Communion with God requires our active participation. Our will must be conformed to God’s will. May we experience Theophany within ourselves, and see the Lord all around us. May our lives be freed from the cares of this world that the Lord might reveal Himself to us more and more. To God the Father, Son, and Holy Spirit is due all glory, honor, and worship now and always, and unto ages of ages. Amen. 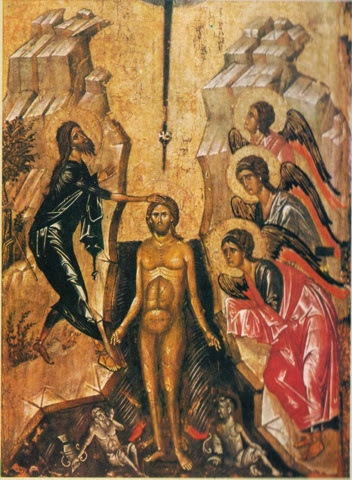 Icon of the Baptism of Christ. Here we see four fishes at Jesus' feet. Two are swimming one way and two, the other way. The other creatures represent the Jordan (left) and the sea (right). Pretty cool to think this reversal of the Jordan's flow still happens every year. When you first see Becky, wearing jeans and a sweatshirt in church with hiking shoes, and sporting a butch haircut, your first reaction is bound to be, "Lesbian." Either that or she lost all her hair from chemotherapy and is just now growing it back. In fact, she's a faithful Orthodox Christian, and whether she is battling the other I don't really know. What I do know is, she's a walking, living miracle. At the coffee hour, she was saying something about how wonderful it was to be walking perfectly well, without even a cane, after so many years in a wheelchair. "Was it cancer?" I asked. "No, it was PLS," she said, "primary lateral sclerosis." "It's much like ALS," she said, "Lou Gehrig's disease." "A progressive disease, I think," I said. I was confused. "But - but there isn't any cure for it, is there?" She shrugged, grinning broadly. "Supposedly. But here I am!" We didn't have enough time to talk, but in broad outline, she came down with the disease when she was in middle school, and she looks to be a thirty-something now. She spent many years in a wheelchair and then one day, she felt herself so much better than in the course of "about three minutes", she found she could walk. "And I wasn't Orthodox then, either," she said, adding that this was what had brought her to the Church. When I met her, a year ago, she was hobbling about on crutches, but now she walks better than I do. And she stands through the whole service, a fitting tribute to Him Who made her able to stand. There is no sign in her body, she says, of the PLS. It's just gone. All this she related to me in the presence of Amanda, who can only walk a few steps at a time, with a crutch. If that doesn't beg the question, I din't know what does: why some and not others? The answer, well, we don't really know, but we do know God gives to each of us what will best help us spiritually. What does it mean when someone who isn't even a church-goer is given a miracle? Of course it means God is forgiving and loving and accepting that person. Jesus pointed out that healing and forgiveness are interchangeable: "Which is easier to say, 'Your sins are forgiven' or 'Rise up and walk?'" Because God wouldn't heal you if He were mad at you. Next Sunday, I intend to ask Becky if she will let me video her telling her story for no more than five minutes. If she says yes, I'll post the video so you can have the firsthand account. I'll also ask her what she might do with her now wide-open future. Last night, in our ecumenical discussion group, I once again heard a Catholic say that after all, we have no significant theological differences. Many Catholics, if not most, seem to have been taught this. It is false, and I thought it useful to show, very briefly, why. So here are just a few of the major differences. We deny the papal claim to supremacy, except in an honorary sense. (Our patriarchs are in no sense intended to be rival popes, nor to be thought of in that way.) You Catholics wouldn't consider that an insignificant difference, would you? We deny the papal claim to infallibility. And these two denials are not mere isolated objections. As if they were not major enough in themselves, they reflect a whole different ecclesiology (doctrine of the Church). We differ on what the Church is and how she operates, how she is governed, and the role she plays in our lives. Is this a small difference? We object to the doctrine of the Filioque. Usually this seems to people abstruse, arcane, and nit-picking, yet its consequences are concrete, profound, and far-reaching. The Filioque is built upon a whole different triadology (doctrine of the Holy Trinity) from the Orthodox one. This means we have two different understandings of who God is, no small matter in itself, but which in turn results in two different, in some points conflicting, kinds of devotional life. The Filioque also has, from the Orthodox point of view, wrong ecclesiological implications. "Palamism", to use the wildly inaccurate Catholic pejorative term, also divides us. What St. Gregory Palamas was defending so vigorously, bottom line, was the fact that the Christian can and does have direct, personal experience of God, a point denied by scholasticism. Obviously this is not a trivial issue, but it is only one of the implications of what St. Gregory fought for. I once made a list of reasons it was important, and as I recall, there were 13 items on it. It is far from true and what really bugs me (and other Orthodox Christians, you can be sure) is that, not lacking in sophisticated, informed, and intelligent scholars, Rome has got to know it is false. How are we supposed to have any real dialogue in the face of that? "Temporal" is Another Word for "Secular"
Recently, the Catholics in our dialogue group proposed to the Orthodox that we needed to unite in order the better to fight the threats of Islam and -get this - secularism. Aside from that not being a proper basis for union, and aside from our belief that to preserve His Church is the Holy Spirit's job, well, I was dumbfounded. What can I say that won't be offensive? Dear Catholics, can't you see the glaring contradiction here?